• Text is divided into five parts: Part-I deals with concepts, evidences and theories of evolution. Part-II peeps into the Mechanism of Evolution. Part-Ill provides a systematic approach to the process of Speciation. 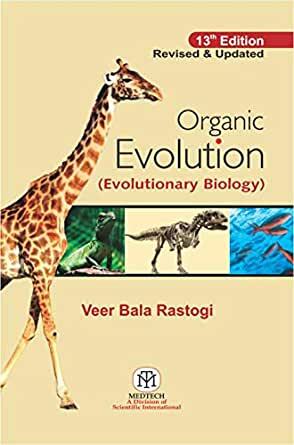 Part-IV explores the basic patterns of Evolution, and Part-V provides an insight into the origin of life, fossil-records and history of life on Earth. • Text is profusely illustrated with diagrams to ensure an easy comprehension of the underlying concepts. • The book would be a useful textbook for students of biological sciences. Unit I-Concept, Evidences and Theories of Evolution: Concept of Evolution • Evidences for Evolution • Theories of Evolution. Unit II-Mechanisms of Evolution: Variation • Gene Mutations • Chromosomal Aberrations • Variation in Chromosome Number (Heteroploidy) • Reproductive Isolating Barriers. Unit III-Speciation: Population Genetics, Gene Frequencies and Hardy-Weinberg Equilibrium • Persistence of Variability within Populations: Polymorphism • From Population to Species (Speciation) • Genetic Drift and Gene Flow • Natural Selection in Action • Evolution of Genes and Genomes. Unit IV-Basic Patterns of Evolution: Patterns of Evolution • Microevolution and Macroevolution • Adaptations. Unit V-Fossils and History of Life on Earth: Origin of Life on Earth • History of Life on Earth • Fossils and Fossil Records • Origin and Evolution of Horse • Origin and Evolution of Man.